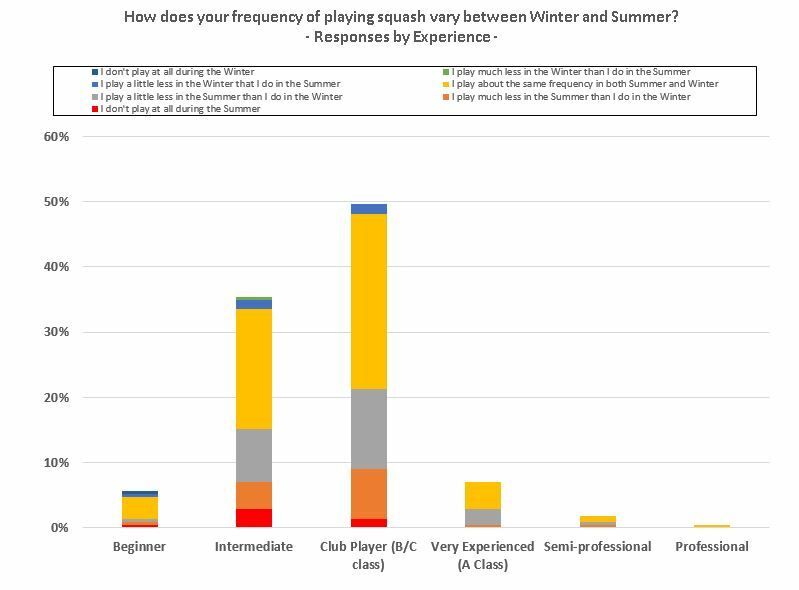 Two weeks ago, I posted a blog post about playing squash all-year-round wherein I posed the question as to why, like myself, players didn’t continue to play squash throughout the squash ‘off-season’. I found some research that had been done, but this didn’t answer my basic question. So – I decided to run a survey myself to see what I might find out. I posted an invitation on reddit.com (r/squash) for players to participate in the survey and after a little time I also opened up the survey to all users of my SquashLeagues website. I managed to get just under 70 responses (around 2% ) from those registered on the /r/squash community (thanks guys!) and around another 160 responses (just over 5%) from the SquashLeagues.org registered users. Any of you who have been involved in running surveys will know how difficult it is to get a high participation rate, so I’m relatively pleased with the response rates I achieved. However, I certainly would NOT claim that this survey is representative of squash players around the world, so please consider the ‘results’ and any conclusions I might draw from them with some circumspection! To repeat my earlier comment – I am not claiming this is representative of the squash playing community world-wide, but it is interesting, no? So – Almost 50% of players have been playing more than 10 years, and 25% more than 20 years! It seems “old squash players never die – they simply continue to boast….”. No major surprises here – mostly intermediate and B/C class players, with around 8% A-class players and even some semi-professional players and one professional! 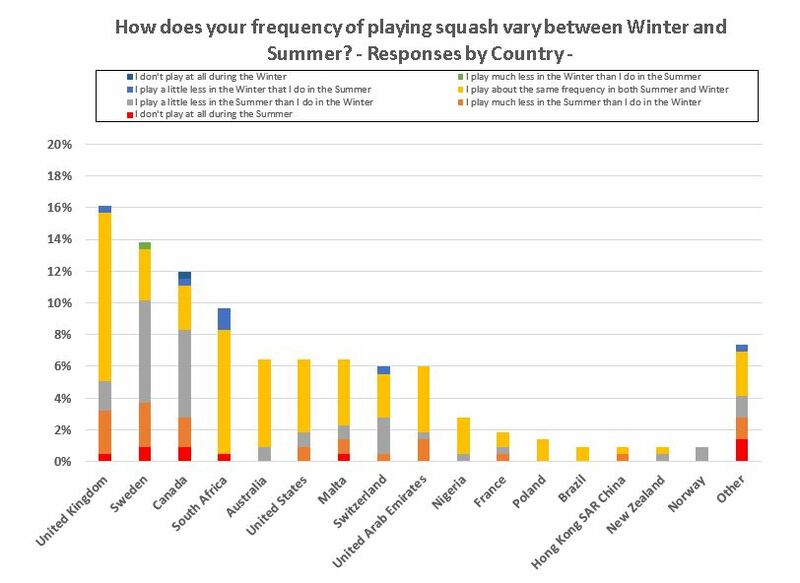 On the surface, there are some interesting countries featuring here – mainly due to those parts of the world where the SquashLeagues.org website is popular – again this is no indication of the popularity of squash in different countries. 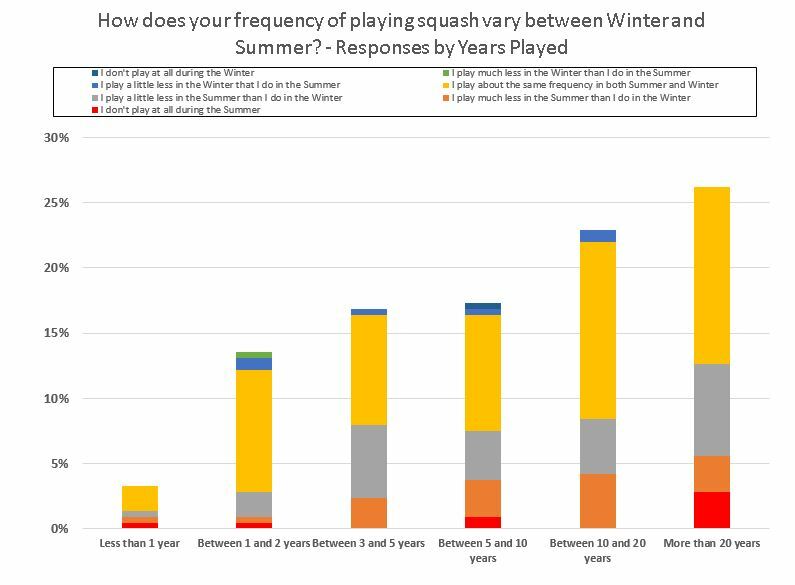 The most important question asked of all respondents was “How does your frequency of playing squash vary between Winter and Summer”, with responses ranging from “I don’t play at all in Summer”, through to “I don’t play at all in Summer”, with various options in between. 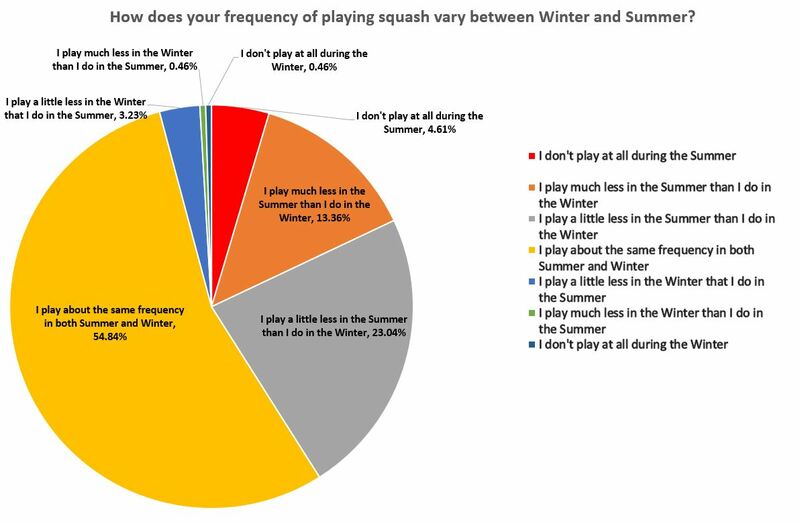 By far the majority of respondents said they played the same frequency in Summer and Winter (55%) or played a little less in Summer than in Winter (23%). Do you play more or less in Summer/Winter? I am a little surprised by how high the total percentage is for people who either play the same or a little less in Summer – a total of almost 78%. Not a huge difference here in the percentage of players playing the same, or a little less, in Summer, perhaps with the exception of the youngest player group. There are some interesting variations shown in the chart above. Countries with colder climates during the Winter seem to favour less play during Summer(Canada and Sweden and Switzerland, for example). There’s not really enough responses to see if there is a difference by hemisphere – I did wonder if this chart would show a difference in response rates for South Africa, Australia and New Zealand, for example – but it’s not really noticeable. Once again, in the chart above, there doesn’t seem to be a marked difference according to playing standard – contrary to my expectations, although there might be a slight preference for less experienced players to find other things to do during the summer months. The overriding conclusion I have come to after completing this survey is that I can conclude very little with any degree of certainty! 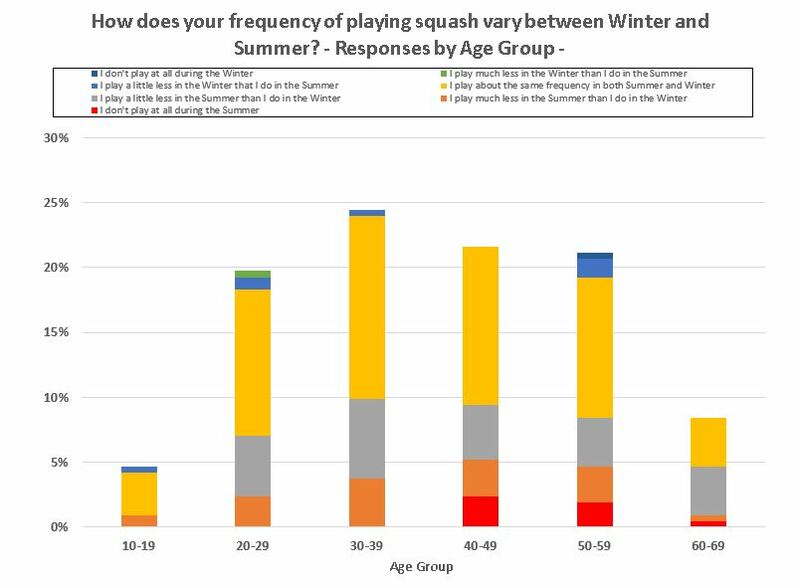 One fact that can be easily demonstrated from the survey is that the average age of the squash player population is quite high (>30 years) – and getting older, of course, with each passing year, since there does not seem to be the number of new young players joining the sport. This is sad news for me personally, as one of the players at the right of the chart (60-70 years old), as I don’t want the sport to ‘die out’ due to a lack of growth at the other end of the scale. I know there are some great things happening in some parts of the world to foster growth in the sport among the young players, but these are generally exceptions. One other fact that the survey supports is that the average length of time people have been playing the sport is quite long – with half of the respondees playing for more than 10 years and 25% playing for more than 20 years. This is a great testament to how the sport ‘gets into your blood’ and once played seriously, it’s hard to let it go. However, even though I received more responses than I anticipated for this survey, the sample size is too small to draw definite conclusions and it was by necessity skewed to certain countries and not representative. Perhaps the World Squash Federation (WSF) could be persuaded to hold a survey to find out more about squash players across the globe – and in particular ask for some guidance from the players at grass roots level as to why interest in the sport is still declining – even with all the great new innovations in terms of watching the sport via TV coverage etc.